Manchester United has today announced a ground-breaking global partnership with leading IT services company HCL Technologies. As part of this partnership, HCL and Manchester United will work together to explore and unveil a number of digital initiatives to transform the experience of the club’s 659 million global followers. 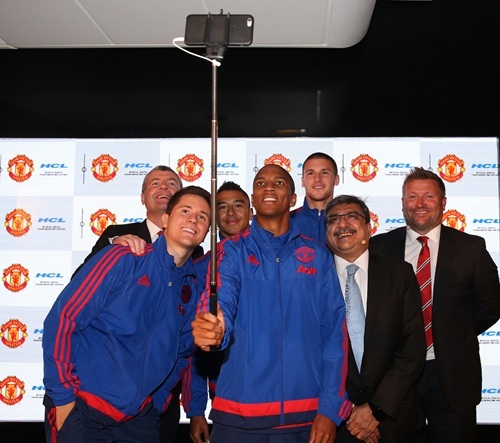 Manchester United’s group managing director, Richard Arnold, comments: “Our partnership with HCL is a first for Manchester United. With the introduction of the United Xperience lab at Old Trafford, we hope to demonstrate best practices within the industry to generate new ideas that leverage the latest technology available in the evolving digital landscape. “This partnership is unique and creates value not just for Manchester United and its fans, but also for all forward-looking organisations across the world,” said Anant Gupta, President & CEO, HCL Technologies. Football and technology seem getting to be sync in a way. We have seen the goalline technology used in world cup. We know the ball made with complicated tech, jersey, the shoes and others. This is the time for Man United not only to expand the experience for their fan. Furthermore the technology to make the club become number one again in England and also dominant in Europian competition.